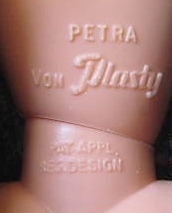 Petra was marketed by Plasty, a company from Neulussheim in Germany. She was introduced in late 1964, around the same time when Barbie was introduced to the german market. Petra had the same size as Barbie (28-29 cm), but was produced with cheaper materials (plastic). Also the Petra fashions were cheaper in quality and price. Many designs were similiar to previous Barbie designs, hence Petra was often called a Barbie(TM)-clone or -competitor. Petra dolls were not produced in Germany, but in Hongkong; also most of the clothes for Petra came from Hongkong. Every year (starting 1965) there was a new booklet that presented available clothes and accessoires. In addition to the "standard" fashion-series, Plasty introduced "Petra Boutique" in 1968, which was promoted as "exclusive" sub-category of Petra clothes. Beside Petra there were Fred (boyfriend or brother; i always thought Fred was meant as the boyfriend of Petra, but i also heard that he was sold as her brother) and Peggy (her little sister) as the main family members. During the 1970s appeared Donna (afro american doll) and Britta (a bride doll). Furthermore I saw a picture of Plasty dolls called Hippie with extra-long hair and hi-color make-up, but i am not sure if they were officially part of the Petra line; their packaging said only, that Hippie can wear the same clothes as Petra. Last but not least there was Goldkoepfchen, another sister of Petra that was produced by Plasty's partner company Airfix around 1979/80. Plasty was founded in the winter 1948/49 by Fiedler and Podey. Plasty produced a lot of other toys, not only fashion dolls. 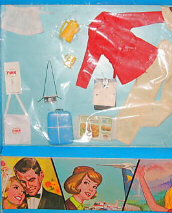 Beside selling their own products, Plasty had acted as a german distributor for the british company Airfix and their toys since 1954. In 1970 Fiedler left the company and Plasty was sold to Airfix (first only partly, completely in 1975 then). Plasty was renamed to "Airfix Germany". Doll boxes of the late 1970s carry the Airfix and Plasty logo. Some boxes have only the Airfix logo (around 1980). In 1980 or 1981 there were financial difficulties and Airfix was sold to overseas. Podey and his brother bought many rights back (with the help of some investors), reanimated Plasty and started in 1981 to produce dolls again. The impressive success story of Plasty went on. In 1987 Plasty was sold to the swedish company Lundby. The doll was now distributed to 20 countries. When investigating the internet, i found products by "Plasty Spiel- und Hobbyartikel, Germany", dated with 1990, 1991, 1992 and 1993 though. Maybe that means, that there were still products made (or at least distributed) in (from) the german location till 1993. However, in 1993 Petra was sold to the american toy company Kenner-Parker/Hasbro. The Plasty production halls in Germany have been closed and sold on 31.12.1993. Kenner-Parker added Petra and Fred as friends to their existing doll line Sindy (a doll introduced in the UK in 1962), 1994-1995 (or 1996) that was. 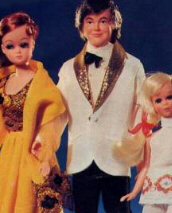 In 1997 Hasbro ceased the Sindy production and sold it to Vivid Imaginations in 1999. I guess that the Petra line was eventually ceased in 1997, too. It seems that only Sindy survived the changes: she returned to her original british production company "Pedigree" in 2003. In opposite to that, Petra's story had ended. That happened, although Petra was always such a successful doll. She even was - after Barbie(TM) though - the most popular and best-selling fashion doll during the 1980s! © 2008-2015. you are welcome to link to my website, but please dont copy contents of my website without permission. Barbie (TM) is a registered trademark of Mattel.